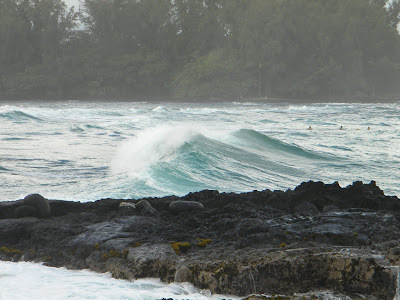 A northwest swell is diminishing but will continue to generate high surf along most of Hawaii's north- and west-facing shores today. Missing moon rocks from the first and last human lunar landings have been discovered in a locked cabinet in Hawaii. The state Board of Education's decision yesterday to conduct a national search for the next chief of public schools reignited a long-standing debate over the $150,000 pay cap on the superintendent's salary. The Board of Education on Monday named its new interim superintendent. The Federal Aviation Administration and National Transportation Safety Board have taken over the investigation of a small single-engine plane crash that took the lives of a prominent Honolulu veterinarian and his 20-year-old son Sunday. Secretary of State Hillary Clinton's speech today on U.S. relations with Asia and Pacific nations will be webcast. The crackdown on illegal kayak vendors at Kealekekua Bay is continuing. Whenever state Rep. Angus McKelvey drives down Front Street and out of the corner of his eye sees that filthy sailboat wreck, he grips the wheel a bit more and let's out a little "grrrr," he said. A Sunday night fire in a Port Allen warehouse bay leased by Mana Divers caused an estimated $250,000 in damages but no injuries, the Kaua‘i Fire Department announced Monday. A man died early Sunday morning after collapsing during the Hawaii Electronic Music Festival at the Palace Theater in downtown Hilo. Tom Greenwell admits he sounds like an infomercial for KonaRed, a new wellness drink made from the ruby red coffee cherries cultivated in Kona.